We try out cars, clothes and even chocolates before we buy. You can test your paint colors, too! As savvy consumers, we generally like to try a product before we commit to purchasing it. Many goods fall into this “try-it” category, including cars, clothes and even chocolates. Paint color also is part of this try-it group—and is a lot easier to test than you might think. If choosing a paint color has you stumped, then read on …. 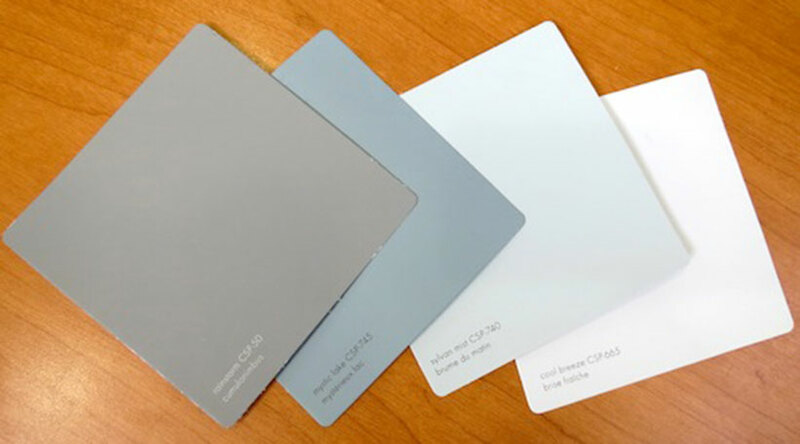 Paint chip cards are a great first start in choosing a paint color. Paint stores have entire color centers set up with racks of cards that you are free to pick up and take home and view in your own space. The racks are set up in a color continuum. So if you’re considering beige for your living room, you can easily identify the “beiges” within the rack and choose the card(s) closest to your desired color. Paint cards usually have anywhere from three to seven analogous colors (those that are close in hue) on the same card. It’s a good idea to take more than one card, since color looks different in-store than at home. This is because paint stores typically have fluorescent lighting, which emits a bluish-green tint. Of course, one of the disadvantages of paint chips is that they are small. Again, they’re meant to be your first step in arriving at your perfect color. Sometimes, this will be all you need. But you may need more support. Many paint companies also produce larger paint samples of individual colors. Typically, these are meant for designers and architects working with clients. However, paint stores occasionally will have these on-hand for residential clients as well. Sheets can range from roughly 4-by-4 inches in size to more than 8-by-9 inches. To use a paint sheet effectively, tape it up in your intended space and view it under various lighting conditions. If you’re painting more than just one wall, move the sample around and view it on the other surfaces, too. One of the best ideas to come from the paint industry in recent years is the availability of wet paint samples. Sold in small containers (typically 2- to 16-ounces), these samples let you brush out the color before finalizing your paint purchase. Typically, an 8-ounce container will cover up to 16 square feet; however, you’ll want to paint two coats to sample the color properly. Pre-Made Sample Board—Many paint stores sell ready-to-paint adhesive-backed sample boards (no priming needed) that are relatively inexpensive. The special adhesive allows you to place the sample wherever you want it—even on the ceiling—and to reposition it as needed without harming the substrate below. DIY Sample Board—If you choose to make your own sample board, use a white poster board—not a wood plank—that is lightly coated and sturdy. Prime the poster board first before painting, and be careful when taping the finished board to your walls and other substrates. Application—Always paint two coats, allowing the first to dry before you apply the second. Make sure the second coat also has dried before you make any assessment. Interiors—Move the sample around the room to observe it in all of the areas where it will be painted and in various lighting conditions. Light is key to viewing color. So make sure you run as many lighting tests as possible by opening and closing window treatments and turning artificial lighting on and off. Exteriors—Sample the colors on multiple sides of the house—either with a sample board or on the house itself—and in various daylight and weather conditions. One really neat way to preview paint color is on your computer. Virtual color-visualizing software allows you to upload a photo of your room and then begin “painting” it by selecting from a digitalized color palette. This technology isn’t new but has been vastly improved in recent years. Best yet? You can find it free online. In fact, several paint manufacturers have it imbedded on their websites where you can access the technology with a simple click. Of course, you may still want to physically sample your paint. But a virtual paint visualizer is another valuable step in moving you closer to your perfect color.